This thread is for live updates and comments regarding the Rolling Stones Anaheim May 15 show. Please tell us your pre- and post-show thoughts and comments here. Edited 2 time(s). Last edit at 2013-05-21 00:17 by bv. Let`s hope they come up with something new tonight! Edited 2 time(s). Last edit at 2013-05-15 16:58 by noughties. the 2 gigs in anaheim will be important to understand more about setlist. it is the 1st time in this tour that they are playing 2 times in the same place . i am not very confident but we'll see how many different songs they will play in these 2 anaheim concerts. same thing for the next staple center concert, let's see if they will change something for their 2nd appointment in l.a. They come up with something new every night, which, in itself, is nothing new. It's like you know they're gonna play something no one ever expects them to play, but is it still a surprise when you know there's definitely going to be some kind of surprise? Think the venue will be full??? The last time I saw the Stones in Anaheim was July 1978. Hope you will have so much fun tonight!!!! The last time I saw the Stones in Anaheim was July 1978. Waiting for all your re-views, I guess some news song on the set-list today.... Imagination, Cold, Worried.... some bets?? I am anticipating Far Away Eyes and that Sway will be played sometime in these next 3 shows. Kate perry is the guest, again. I reluctantly tolerated her once, but twice? this just in: katy perry has been added to all the remaining dates of the tour. jagger as a result of voice problems, has been replaced by Pate kerry. Any word on the song vote on the Stones app? Who will be the choir tonight? I heard something about Slash guesting tonight. Any credibility in that statement? Woody posted a pic with him. 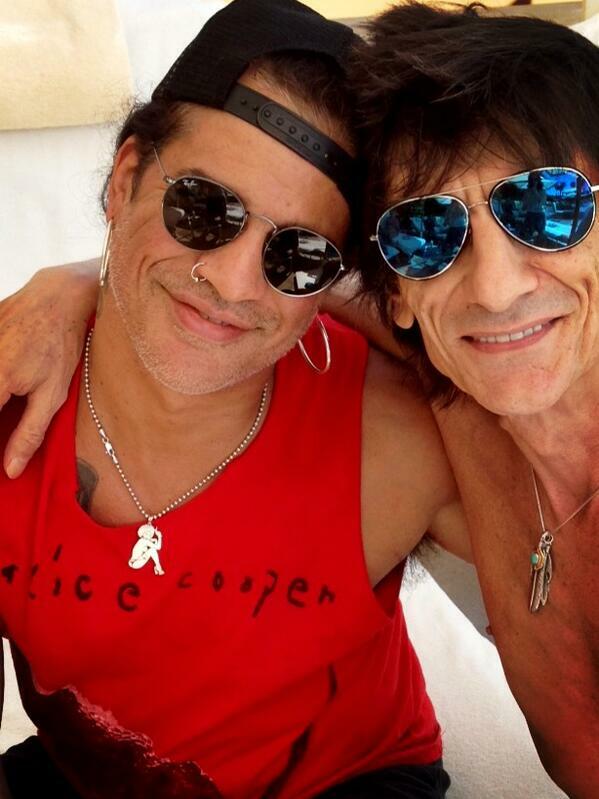 Ronnie and his pal Slash in LA yesterday. Possible guest in Anaheim? Judging by the pic, Slash will guest tonight on the rare 1978 Stones outtake "Armpit Blues". I'd like to see both Slash and Mick Taylor guesting on Midnight Rambler. They'll both solo at the same time, first one to stop loses.